This is the official Shipbucket Style Guide & Standards Manual. This guide will contain instructions on the proper use of the Shipbucket Style to portray ships (and other vehicles) using the Shipbucket Scale. When scaling drawings, make sure to use as many decimals as possible when converting units. However, since Shipbucket drawings are a pixel format (and thus limited to round numbers), artists will need to round up or down on the final measurement. This is a limitation of the format, and interpretation of when to exaggerate details and when to ignore them is up to each artist. As most Shipbucket drawings are traced from original blueprints or line drawings, it's very important to properly compute the correct scale measurement and resize the original for tracing. The best tool for converting units and calculating scale measurements is Google Calculator. There is a difference between "Length Overall" (LOA), "Waterline Length" (LWL), and "Length Between Perpendiculars" (LPP). This is fairly well explained in this article. If you have questions about the proper measurements for a ship, please ask on the forum. Please note that guns with bore sizes larger than 203mm are large enough to be shown accurately in the Shipbucket scale without any overstating necessary. Missiles and torpedoes carried and launched by a ship are shown above the drawing when placed into the Shipbucket template. Like gun barrels, missiles and torpedoes can also be slightly overstated to show detail. There is no set practice for correctly scaling missiles and torpedoes - the rule is to make them easily recognizable, without making them too large. For arm launchers, draw the launcher itself in the proper scale, and only show the missile mounted to the arm launcher rail if it doesn't negatively impact the overall perception of the drawing. Shipbucket drawings are created by first drawing the outline of the ship using solid black pixels, and then filling the interior of the shapes the artist has created with varying shades of grey. The outline of the drawing should always be black, except in cases where the object in question is smaller than six inches (the width of a pixel in this scale). These areas of the ship (such as railing, rigging, antennas, etc.) should be shown with light grey. A lighter shade of grey will imply a thinner or smaller object. Temporarily-rigged objects, like canvas awnings, or rolled bedding along railings, should be outlined with a darker variation of their base color, instead of black. This is to show the viewer that these are not permanent fixtures on the ship. All lines must be one pixel thick, regardless of color. Ensuring your lines do not have extraneous black pixels will result in a much cleaner drawing, and allow extra detailing to be added without creating large black areas which are confusing to the eye. 3.1 The "Three Pixel Rule"
The "three pixel rule" describes the deliberate overstating of some areas whose significance may be lost if they are reduced to a single pixel in width. Since the pixel format automatically prevents us from showing these features with a two pixel line (see section 2), we are required to show these features with three pixels. This applies to things like pole masts, mast platforms, catwalks, steam escapes on funnels, stairways and inclined ladders, etc. This is an inherent limitation of the pixel format. For horizontal surfaces that should be shown with three-pixels, the rule of thumb is that if a person can walk on it, that part of the ship should be drawn with three pixels. 3.2 The Art of Exaggeration, and the concept of "viewing distance"
The pixel format of Shipbucket art means that artists must be skilled at knowing when to show detail and when to ignore it. Too much detailing can lead to a cluttered and complicated appearance that most viewers will not be able to decipher. The standard railing segments are defined as 6 pixels (3 feet) in height, with two horizontal lifelines spaced evenly, and stanchions (vertical segments) spaced every 5 pixels. Railing should follow the curve of the deck where applicable, and stanchions should be placed closer together on areas that curve away from the viewer, to indicate the shape of the platform. Ladders should be 4 pixels in width, with 2 pixels between each rung. Ladders on areas that curve away from the viewer should be shown with a width of 3 pixels. Railings and ladders should be colored to match their material or paint scheme; the grey color shown would apply for railings and ladders made of metal and painted grey. For ships that have a hangar, helicopters should be shown landed on the deck. For ships without a hangar (but with a helipad), the helicopter should be shown hovering above the ship's fantail. If the ship normally embarks multiple helicopters, one more helicopter can be shown hovering above the helicopter parked on the deck. The below set of cropped drawings shows the correct way to display helicopters, with the first example (which includes a hangar) showing the helicopter parked on the helipad, and the lower example showing it hovering. The basic shade. This is the "standard" shade used throughout the drawing, and provides the basic shade color for the upper structure. The highlight shade. This is used to highlight the basic shade on the superstructure. The shadow shade. This is used in place of the basic color on the hull, and used to shade the basic color on the superstructure. The dark shadow shade. This is used to shade the shadow color on the hull, and to show railings and wire rope rigging. Note: other colors can be used to show cotton/hemp rope rigging, or wooden railing, etc. The darkest shadow shade. This is used to shade large overhangs, and to demarcate angular breaks in the superstructure less than 90 degrees in angle. It can also be used to show heavy railing and whip antennas. These colors should be used consistently across the drawing. 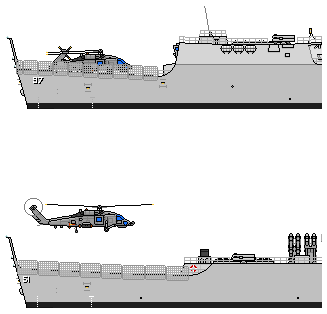 For most military ships, which are commonly painted in a uniform "haze grey", only one palette of grey will be needed to shade the above-water portion of the ship. A similar palette of red-brown (to represent red anti-fouling paint) will be used on the below-water hull. Ships that are painted in more than one color (such as civilian vessels, Victorian Era warships, and camouflaged ships) will need a palette created for each different color. This color should then be applied consistently across the drawing to depict the camouflage pattern or livery where required. "Window blue". This is a standard shade of blue used to color portholes, pilot house glazing, aircraft canopies, and all other glass window areas. 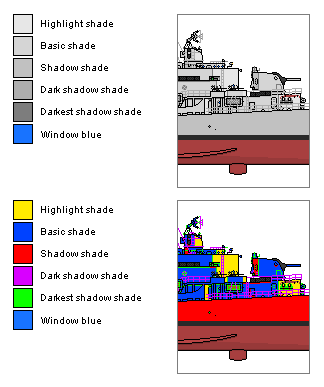 Please note: the colors given above are not requirements for producing Shipbucket drawings. As always, artists are free to develop their own palettes. Camouflage application should be consistent across the ship. This requires creating a matching palette of camouflage colors that correspond to the five shades described in section 4. A detailed tutorial on how to draw camouflage is planned. Shipbucket does not allow the depiction of worn, battle-damaged, or wrecked ships. This is only one example of how to shade structures in the Shipbucket style. The shading requirement for drawings is fairly loose, and there is room for individual styles (within reason). The below-water portion of a ship's hull is often very difficult to portray correctly using only a few shades. 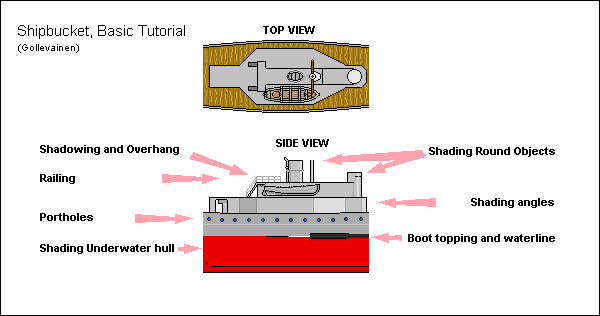 Generally a "faired lines" plan is required to show the exact curvature of the hull to allow the correct shading to be applied, and if an artist chooses to shade the hull then it must be consistent with the superstructure shading as well. Use of gradients to shade Shipbucket drawings is not allowed. Software-generated gradients will fill a space with hundreds of different shades of grey, making editing the drawing very difficult for other artists. One of the goals of Shipbucket is to create drawings that anyone can freely edit with simple photo editing software, and using gradients on Shipbucket drawings will prevent this. Shading applies to structures underneath overhangs, such as catwalks or bridge wings. The artist should use one of the dark shade colors in 1-3 pixel blocks underneath to represent the shadow cast by the overhang. Gradients should never be used to shade overhangs. The background of all Shipbucket drawings is blank white (#FFFFFF or RGB 255,255,255). All Shipbucket drawings are posted using the Shipbucket template. 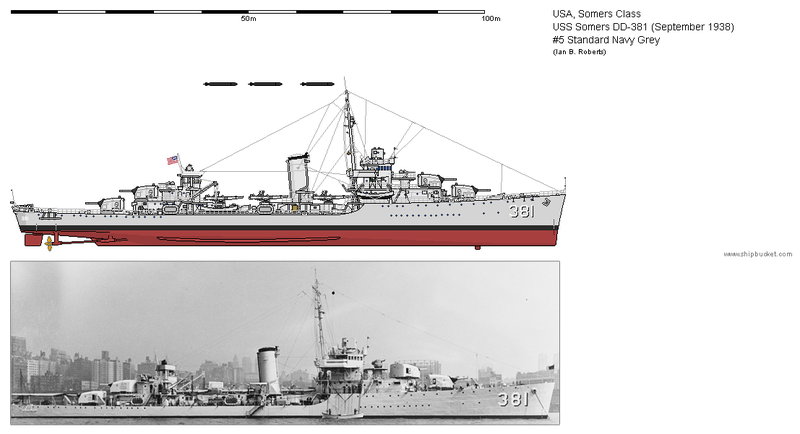 This is the standardized information card that accompanies each drawing, and includes the scale bar, watermark, class/type information, author credits, and (where applicable) coat-of-arms or ship's crest details. Anti-aliasing refers to the method some software uses to make on-screen text appear smooth and crisp. This type of font effect is not allowed when posting work in the official Shipbucket template, as anti-aliasing leaves "artifacts" on the text, which can make editing difficult. See below for an example (left) of aliased text, versus anti-aliased text (right). Anti-aliased text is not recommended for use with Shipbucket drawings. Some software (such as Photoshop) allows this feature to be toggled, but simpler solutions like MSPaint will use whatever setting is defined in the user's operating system. To properly generate aliased text in MSPaint, you will need to disable "ClearType" in your system settings. Please run a Google search on how to do this, but be aware that it will change the way text is rendered across every program on your computer! The correct font size for the Shipbucket template will be different for each program, due to variations in how font sizing is rendered between software. During earlier times, Shipbucket had an extremely strict rule about font sizing, but this is no longer the case; artists should just do their best to get the font size on their template to match existing examples. All Shipbucket drawings have the original author(s)' names shown in parentheses below the ship class and name in the top right corner of the template. Always place your name on the drawings you have created. Artists who modify others' drawings must place their name after the original author's name in the template's credit line. Never remove the original artist's name. Weapons, radar antennas, electrical equipment, boats, cranes, aircraft, and so on. Objects that are not considered components (and require crediting) are parts that are unique to that ship and not designed to be placed aboard other vessels, such as masts, superstructures, funnels, hull extensions, propeller shafts, and bilge keels. Use of this type of component requires crediting, unless the original artist grants you permission to remove their name from the credit line. The only image format currently accepted for use with Shipbucket is the Portable Network Graphics format (PNG). Any image processing software can save into this format. Do not save work in the JPEG format. JPEG is a "lossy" image format, designed for optimizing file size of photographs. When images are saved in the JPEG format, compression artifacts are created on the image. This is generally accepted when saving photographs, but these artifacts will ruin a Shipbucket drawing as they will introduce stray and random pixels all over the drawing. Once a drawing has been saved in JPEG format it becomes unusable.